I love lettuce wraps and have tried several recipes in my day (read: PF Chang Knockoff recipes). They were good, but very involved and time-consuming to make. I saw this recipe on Our Best Bites and wanted to try it for simplicity’s sake. I made a few changes to make them less salty and a bit more to my family’s liking (as in, omitting the cabbage), and overall they were a huge hit. The great thing about a recipe like this is you can alter it to your taste – more crunch? Add in another can of water chestnuts. More zing? Zest another lemon. Great concept, and talk about a light and delicious meal! 1 lemon, zested and then juiced. Heat vegetable oil in a large skillet over medium heat. When the oil is hot add minced garlic and ginger. Saute for a minute just until fragrant and then add in the ground chicken, minced mushrooms, and salt. Cook until turkey or chicken is cooked through. Add in the water chestnuts and green onions. Cook for a few minutes until cabbage starts to wilt. Add in the soy sauce, sesame oil, juice and zest from the lemon, and hot sauce. When everything is cooked through, remove from heat and stir in the cilantro. To serve, carefully separate the whole leaves from the lettuce. Wash the lettuce leaves and wrap them in paper towels and put them in the refrigerator so they are cold and crisp when serving. Spoon chicken filling onto the lettuce leaf and then roll it up and serve with dipping sauce below- or any other favorite Asian dipping sauce. For the sauce, combine all ingredients and serve with lettuce wraps. Mel, these were delicious! I can’t believe I made this! Thanks for inspiring me to do something out of my norm. I LOVE your website, the photos are so amazing and the recipes are delicious! At least, the few I’ve tried so far. And I’ve been so impressed I’m planning on trying many, many more! I’m wondering how essential the sesame seed oil is for this recipe. I found it at my grocery store but it was really expensive! Any suggestions for a more budget friendly substitute? Tiffany – that’s too bad the sesame oil is so expensive. I’m kind of surprised the price is so high – have you checked other grocery stores? I can usually find a small bottle for about $1.50 or so. Anyway, don’t break the bank for this – just leave it out – although if you can find it cheaper, definitely use it. It adds a delicious nutty, deep flavor. Anonymous – I believe the original recipe calls for 4 cups minced cabbage. The dipping sauce was amazing! Definitely a keeper for dumplings as well as lettuce wraps. The lettuce wraps were very good as well. I used chicken instead of turkey, spring onions instead of scallions and parsley instead of cilantro. Also used a little less chicken (1 pound). Yum yum. Celia Marie (W.) B. – I’ve tried recipes that use finely chopped chicken, too, but loved this recipe for the ease of using ground chicken or turkey. 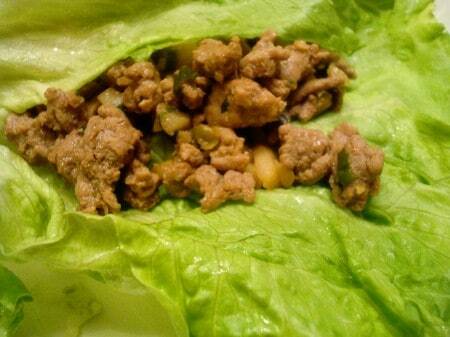 You may lose some authenticity to the restaurant style lettuce wraps but it’s great for speed! Lady Amalthea – glad you liked this! That’s high praise if it reminded you of authentic Chinese cuisine. OOOOOOOO, CAN’T WAIT TO TRY THAT TOO ! My recipe folder is brimming over with My Kitchen Cafe recipes !!!!!!!!!!!!! Jade – thanks for checking in – glad you liked the recipe! Thanks for this recipe! I too have found others that were way to complicated. This one looks just perfect! This is one of my favorite things! I’ll have to try this recipe! mmm.these look like a perfect summer time meal. These look so yummy! You should ask amanda for her P.F. 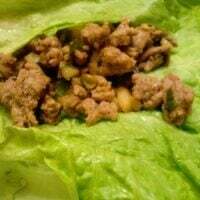 chang’s lettuce wrap recipe…it is as close as you can get! I love it when she makes them! Oooh yummy! That looks easy even! This really reminded me of my partner’s (Chinese) grandfather’s home cooking. Delicious! Melissa – thanks for your comment! I’m glad you’ve found recipes that you have liked. Thanks for letting me know. Hey Tami – fun to see your comment. I’m glad you liked these. Thanks for checking back in to let me know. I made these and the family devoured them. So good. My supermarket had a choice of ground chicken thighs or breast and I chose the thigh because it was so much cheaper and they turned out delicious. No one liked the dipping sauce and they really didn’t need it so next time, I’ll serve them without it. Definitely a “make often” recipe. Alexandra – thanks for posting your changes to the recipe. I’m glad you liked it…and the dipping sauce! This sounds so much simpler than the more complicated recipes. I love lettuce wraps. I enjoy your blog!! Sounds delish…I love lettuce wraps! I’ve made these a couple times and found that I prefer very finely dicing chicken instead of using ground chicken or turkey. It helps with flavor and texture in my opinion. Shari – that’s always a bummer when you have to share food! Thanks for letting me know you liked the recipe. Thanks for the Asian Lettuce Wraps recipe. Last summer I ate them at a lunch party and has been looking for an authentic recipe ever since. Now I will be able to make them myself. Thanks again. I know you said you left out the cabbage but I’d like to try it with the cabbage. How much? Thank you for this recipe.Very tasty yummm!!! I have not tried lettuce wraps yet. These look really good! Delicious! Unfortunately my children loved them too and I had to share! I really like the way you prepare it, it looks very lovely!